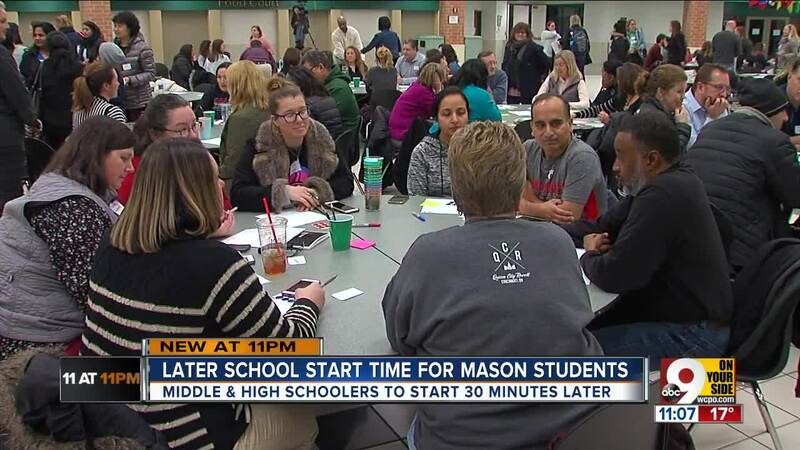 MASON, Ohio — Middle and high school students in Mason City Schools will begin the 2019-’20 school year Aug. 20 at 7:45 a.m., 30 minutes later than they started on the first day of school in 2018. The district announced the change — and another in the works — in a Monday night meeting with students’ families. “We’ve had for many years students and families talking about how they were concerned about their 7:15 a.m. start time,” district spokesperson Tracey Carson said. According to Carson, the complaints have revolved around both convenience and mental health. The impact of such an early start on teens’ sleep, especially, became a point of concern. “By the time they're done with school, they're crashed,” mother Jennifer Benson said of her two high school age daughters. “Sixth period is always the time when my daughter says she's about to fall asleep." The later time for middle and high schoolers was set in stone by the Monday night meeting, but families were also briefed on a pair of plans that would change elementary schools’ start times. Under the first, third-through-sixth-graders would begin class at 8:55 a.m. Pre-kindergarten-through-second grades would begin at 9:35. The district estimates this arrangement would save about $150,000 annually if implemented. Under the second, fifth and sixth-graders would start at 8:55, third and fourth-graders would start at 9:10 and pre-kindergarten-through-second-graders would start at 9:30. This plan is cost-neutral, according to the district. Families will vote on the two plans via an anonymous survey, and the district will make a decision by Jan. 31. "We're not going to say that this is going to solve all of the issues that are facing our students, but it's a start,” Carson said.